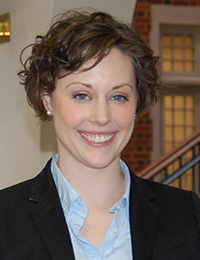 Kathleen Dwyer, a graduate of the University of Richmond School of Law and Virginia Tech, is the winner of the 2014 Oliver White Hill Law Student Pro Bono Award. The award, named for a late Virginia civil rights litigator, recognizes a law student’s commitment to uncompensated or minimally compensated pro bono work and other public service. It is bestowed by the Virginia State Bar Committee on Access to Legal Services. During her law school career, Dwyer volunteered with an intensive writing project through the law school’s Pro Bono Veterans Appeals Program and served as part of the writing team that prepared a veterans law update for the Federal Circuit Bar Association that was published in the FCBA Journal. Dwyer also participated in the Criminal Appeals program at the Harry L. Carrico Center for Pro Bono Service, where she worked with attorney Cullen D. Seltzer of Sands Anderson in the representation of an indigent defendant. Dwyer wrote the appellate briefs and argued the case before the Virginia Court of Appeals. The award will be presented on June 13 during the Virginia State Bar’s Annual Meeting in Virginia Beach.